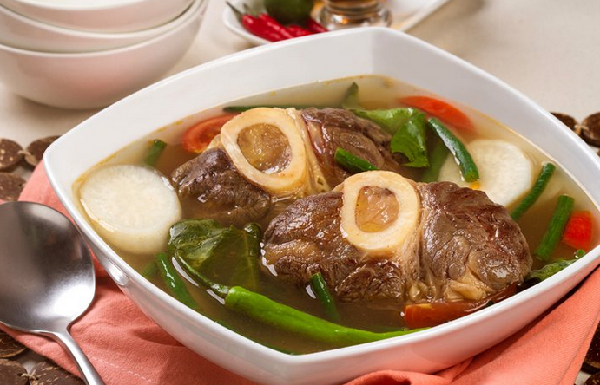 Coming next is Magic Bulalo Sinigang. Chef Boy hies off to a condo in posh Eastwood City to cook this mouth-watering dish for a balikbayan who worked in Japan for more than a dozen years and her son who was born there and therefore has very little experience with the joy of Pinoy foods. Indeed, that extra zing that defines Filipino dishes expoldes in this special chow. and a half to 2 hours. 2. When tender, add in labanos. Cook for 3 minutes. Add sitaw and cook for another 2 minutes. 3. Stir in MAGGI SINIGANG SA SAMPALOC MIX. Bring to a boil. 4. Season with salt or patis. Add kangkong and remove from heat. Add siling panigang if desired.